Group interviews can be deadly. Each reporter has his or her own agenda and often fails to follow up on an interesting point raised by another reporter's question. If the person being interviewed tends to be dull, as was the case with Linda Evans, reporters may even begin questioning each other. The story that follows, admittedly, is self-indulgent and smartass, but in a way it is a better account of a celebrity interview than many that tried to organize the answers into something revealing about the person who gave them. Evans was sent across the country in 1965 to promote her first series, "The Big Valley," which starred movie legend Barbara Stanwyck, by all accounts one of the nicest, classiest people who ever settled in Hollywood and a great role model for anyone who worked with her. Stanwyck played Victoria Barkley, a widow who owned a big hunk of land in the Old West. Not surprisingly, some snide critics referred to her as Ma Cartwright, because her series seemed so obviously ABC's version of NBC's monster hit, "Bonanza." People today may have a difficult time understanding why Westerns ruled television 50 years ago. But they did. Evans played Stanwyck's only daughter, Audra. The Barkley sons were Jarrod (a lawyer played by Richard Long), Nick (the mandatory hot-tempered hero, played by Peter Breck), and Eugene (played by Charles Briles). Eugene Barkley can be compared with Chuck Cunningham, older brother of Richie (Ron Howard), on "Happy Days." Both Eugene Barkley and Chuck Cunningham were seldom seen during the first season of their respective shows, and both disappeared by season number two. No soap opera, whether set on a ranch in the Old West or in a mansion in a contemporary setting, is complete without an illegitimate child. On "The Big Valley" that was Heath Barkley, played by Lee Majors, who would emerge as the most popular star in the series. The Linda Evans who was a regular on "The Big Valley," the Linda Evans who met with reporters in Cleveland in 1965, bore little resemblance to the Linda Evans who emerged several years later from her relationship with John Derek. That woman seemed like the old Linda Evans on steroids. While the fashion during the "Dynasty" era seemed to favor shoulder pads, Evans didn't appear to need them. While the "Dynasty" Evans clearly was a bigger star and considered more glamorous, for my money she wasn't nearly as attractive as the rather shy Evans who often faded into the background on "The Big Valley." Alas, Evans, at 70, apparently is a victim of surgical overkill that turned a once lovely face into a poster for abuse. 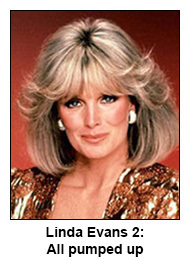 Through her life and her various images, Linda Evans has maintained a reputation as one of the nice people in her business. Which is a good thing, because in her prime – when she was flexing her muscles as Krystle Jennings Carrngton on "Dynasty" – she looked big and strong enough to pick up anyone who crossed her and snap him or her in two. Well, I bet you’re glad to be back home in Hollywood. That cross-country tour to promote your TV show – “The Big Valley” – must have been a drag. Yes, I know. You said you didn’t mind meeting newspaper reporters every day and answering the same silly questions: What are your measurements? Is your show an imitation of “Bonanza”? What are your measurements? Are you going steady? What are your measurements?” Etc. And you didn’t mind. At least, you didn’t appear to. It was difficult telling what was going through your mind. Your answers seemed truthful, all right, but it was as though you were reading them from index cards. Oh, I don’t blame you for being bored. There really wasn’t much you could say, except, perhaps, to admit such publicity trips are usually a waste of time. Sorry, that’s not a reason. Oh, you’re certainly worth looking at, and you’ll be even better when you are out of your “Hey-don’t-I-look-like-Yvette-Mimieux” phase. But if beautiful women were enough of a reason, then men would be watching “Gilligan’s Island,” heaven forbid, to see Tina Louise and Dawn Wells. Especially Tina Louise. ABC should have provided another gimmick. They could have found several in the tub thumpers handbook. For one thing, ABC could try to capitalize on the obvious fact your show IS a “Bonanza” rip-off. The network could wage a mock campaign – “It’s time for a change” kind of thing. You could challenge your “Bonanza” counterpart, Little Joe Cartwright, to a public debate on Western issues such as rustlers, railroad land grabbers and a saloons that employ loose women. ABC could try to duck the “Bonanza” issue completely, but that’s difficult and impractical. After all, the comparison with “Bonanza” is the only thing “The Big Valley” had going for it during the pre-season hoopla. You didn’t have the built-in advantage of “Mister Roberts,” “Wackiest Ship in the Army” and “Please Don’t Eat the Daisies” ... titles that already have been successfully used on stage, in books or on the big screen. Further, you showed no imagination in the way you traveled across the country. A plane. Good grief! Any publicist’s guide to corny promotions says you should have headed East in a buckboard pulled by a team of horses. I also noticed you hadn’t memorized any silly facts about the Old West. Not once did you attempt to authenticate a “Big Valley” script by saying it was based on a little-known incident during a cattle drive from Elko, Nevada, to Sullivan’s Slaughter House in San Francisco. You didn’t even promise your series would be “different.” Frankly, that was a refreshing touch. You were even frank about your career and admitted the publicity release the network prepared was a lot of baloney. Especially that part about trying to find a husband who wasn’t an actor. And your remark about that was the highlight of the day – “Sure, I’d marry an actor. I’d even marry a newspaperman” – even though I wasn’t sure how to take it. And I sort of admired your courage in admitting you had a role in “Beach Blanket Bingo.” You didn’t even bat an eyelash. You acknowledged your shortcomings as an actress, and for a young woman who confessed to being egotistical, you sure were a good sport when the men who were interviewing you suddenly got sidetracked by an argument over pro football. You might have been completely ignored for fifteen minutes, and you didn’t even pout. Come to think of it, you were too busy eating. Do they always try to starve you on those trips? So, Linda, the next time ABC asks you to hop around the country to promote a television show, tell them to go pound sand. They want someone to tell all kinds of lies and do all kinds of wild things to get publicity. You’re clearly not the person for the job. You’re too quiet – and perhaps too honest. Incidentally, I've since watched “The Big Valley” and I liked it. A copy of “Bonanza,” but better. Well, I never have enjoyed those daddy’s boys who live on the Ponderosa wondering which one of their father’s wives was their mother or whether they were dropped off at the ranch by a family headed for Oregon. Your cowboys, at least, are real men. Now that’s something you should have told us.